A tutorial of Enpi kata from Shotokan version performed by Serge Chouraqui (8th Dan). Enpi | Performer: Serge Chouraqui | Duration: 00:01:44 | Format: mpg | Video Size: 17,3 MB | Player: Windows Media Player or Media Player Classic. A turorial kata of Heian Shodan kata with applications from Shotokan version performed by Luca Valdesi. 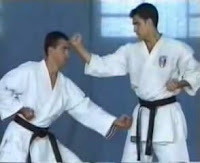 Heian Shodan | Performer: Luca Valdesi | Duration: 00:06:42 | Format: wmv | Video Size: 26,3 MB | Player: Windows Media Player or Media Player Classic.